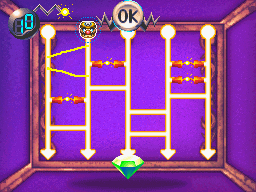 Wario's Ladder is a minigame in Wario: Master of Disguise. For this event, there will be five columns, with Wario's head starting to slide down to the bottom of the screen from the top of one of them. Along the way down, there will be lines connecting the columns. At the bottom, there will be a gem, where Wario must arrive. Pressing OK to send Wario down the line, he will follow any line connecting the columns as he descends. As the player clears many levels, there will be some bombs trough the lines which Wario has to avoid. The game ends if Wario touches one or if he takes the path that doesn't have the gem. "After you hit OK, Wario's face will fall and turn each time it meets a new line. Before you hit OK, draw lines that will force Wario to move down a path to reach the gem!" This page was last edited on November 13, 2018, at 22:57.